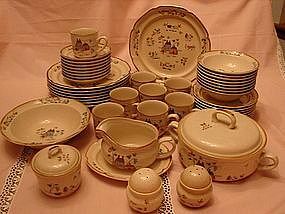 International Heartland Dinnerware, (8 each plates, dessert plates, bowls, cups, and saucers, covered casserole, salt and pepper, sugar bowl with lid, serving bowl, gravy boat and detached underplate)49 total pieces. 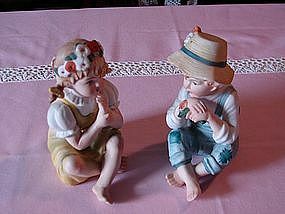 Except for minor crazing on a couple of pieces, it is in excellent condition. Country themed dishes are very pretty. 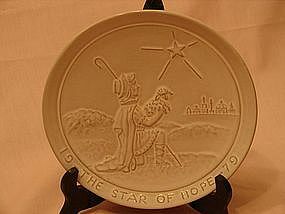 Frankoma 1988 Christmas collector plate. 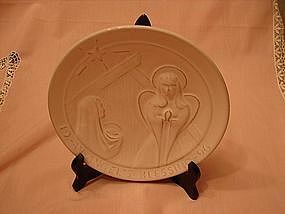 Frankoma 1988 Christmas collector plate. 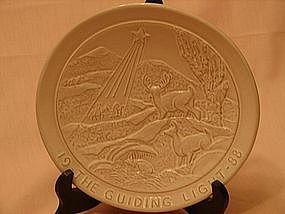 "The Guiding Light" 8 1/2 inches in diameter. Mint condition. Marked Frankoma and signed by the artist/designer. 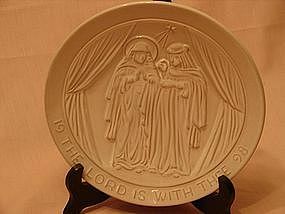 Frankoma 1996 Christmas collector plate. 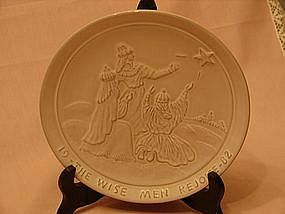 Frankoma 1996 Christmas collector plate. 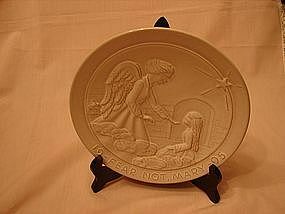 "An Angel's Blessing" 8 1/2 inches in diameter. Mint condition. Marked Frankoma and signed by the artist/designer. 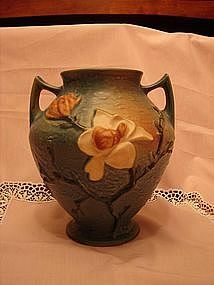 Roseville Blue Magnolia pattern double handled vase. Marked Roseville USA 92-8". 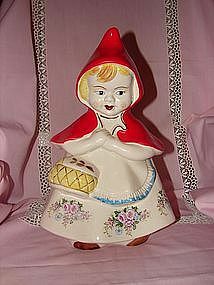 Eight inches tall. Perfect condition. No chips cracks, nothing. Magnolia is getting hard to find. 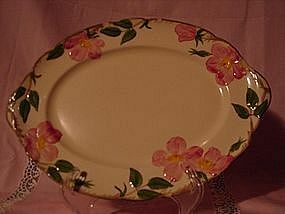 Franciscan Desert Rose 14" serving platter. 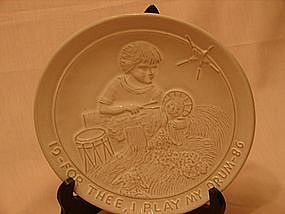 Has made in USA backstamp not the made in California. It was discontinued in 1984. Good for a starter set if you are wanting to start a collection. Has two small chips noticeable in photo on the top edge. Price reflects these chips. Easily restorable. 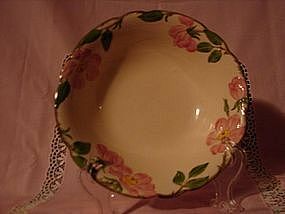 Franciscan Desert Rose 9" round serving bowl. Has a hairline glaze crack that you can't see in photo. Price reflects this defect. Has Made in USA backstamp not the made in California. It was discontinued in 1984. Good for a starter set if you are wanting to start a collection. 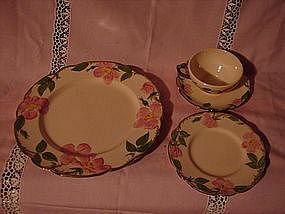 Franciscan Desert Rose four piece place setting. 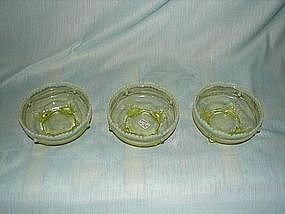 You get 10 1/2" dinner plate, 6 1/2" bread n butter or dessert plate and cup n saucer set. Has Made in USA backstamp not the made in California. It was discontinued in 1984. Eight sets available. Good for a starter set if you are wanting to start a collection. Used but in excellent condition. 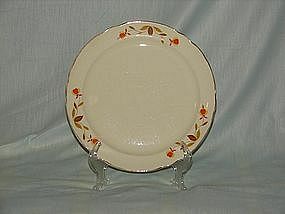 Hall Jewel Tea Autumn Leaf 10 1/4" dinner plate. Made in the 50"s. Shows minor wear on gold trim around edge. No chips or cracks. 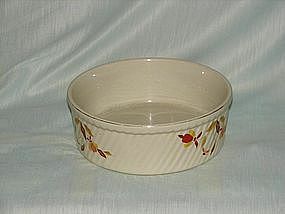 Hall Jewel Tea Autumn Leaf 7 1/4" deep bakers bowl. Made in the 50"s. Shows some wear on gold trim around rim. 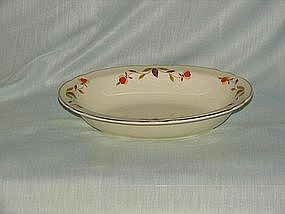 Hall Jewel Tea Autumn Leaf 10 1/4" oval vegetable bowl. Made in the 50"s. Mint condition.